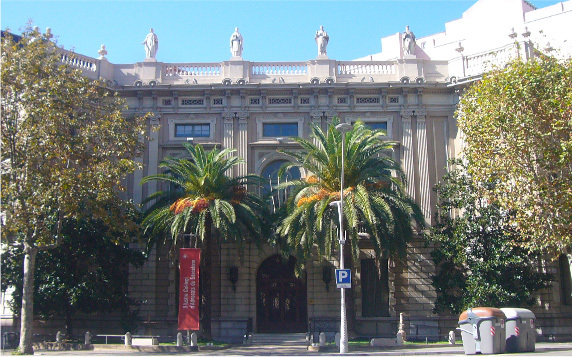 The Palau Casades, the current headquarters of the Barcelona Bar Association, is located in Mallorca Street, between Roger de Llúria and Pau Claris streets. The Palauet Casades shows us a type of architecture which has almost disappeared from the Eixample district. Built in the 1880’s as the residence of a wealthy family. Pau Casades i Espoy initiated the purchase of several plots which belonged to different owners in order to create one sole property on the chamfered corner between Mallorca and Roger de Llúria Street. His intention was to construct a single-family dwelling with an extension which would be the garden. In 1924, Barcelona Bar Association purchased the residence of the Casades family, with a small garden space and outbuildings that were the old stables. Over the years, the Association increased their headquarters by purchasing plots and constructing a new main building at the beginning of the 1950’s. Finally, at the beginning of the 70’s, the last building work was commenced. The Bar Association has respected the original palace that is preserved today. The place chosen by Casades upon which to build his home was still a place with low building density, especially taking into account that up until the end of the 1870’s it was occupied by the Campos Elíseos, the most important leisure and recreation space in the city. They were inaugurated in 1853 and were a combination of a garden, amusement park, ballroom, concerts, café… the space was parallel to the Passeig de Gràcia and stretched from Rosselló to Aragó, bordering Torrent de l’Olla. In a progressive manner, the Campos Elíseos ground became smaller and smaller due to the pressure for construction. Pau Casades was born in the town of Agramunt in 1819. At an undetermined date, but when he was young, he arrived in Barcelona where he worked in the companies of the banker Manel Girona. He used the knowledge that he had acquired to open his own company which printed fabric using wooden moulds, but at the end of the 19th century the company went into liquidation and he sold it to a Basque industrialist. He married Dolors Xinxó Marton with whom he had his only son, Francesc Casades Xinxó. In 1882, now his own businessman, he decided to build himself a single-family home. From 1893 when the businessman detached himself from the factory he dedicated himself to buying urbanised ground in Barcelona. Pau Casades died in 1902 when he was 82 years old and his son Francesc died in 1915. Therefore, his profile is that of a wealthy industrial bourgeoisie who moved his residence to the Eixample district. Up until then, his residence had been at number 37, Marquès de Barbarà street, in the Raval district where his printing factory which was founded around 1860 was also located. The Palauet Casades stood on a plot with a developable surface of approximately 3,665 m2, which was the result of the union of ground from five different owners. On the 17th of November 1892 Pau Casades asked the Barcelona City Council for permission to construct a residential building which, with connected buildings, took up 824 m2, the rest of the grounds was to be used as a garden and orchard (2,841 m2). The plans for the project were signed by Antoni Serra Pujals, a master builder of the time about whom not much is known. The Palauet was without doubt the building with the most essence that he built during his professional life, and represents one of the few examples that we have of the First Architecture of the Eixample. The layout of the building is that of a rectangular floor, three storeys high, all presided over by a central patio, which regulated the distribution of the different areas and organised the main access points. However, the mansion uses generous amounts of several types of stone and combines them with the stuccoed walling, depending on the level of representativeness that they wanted to bestow the façade. The main entrance is located in the centre of the façade on Mallorca street through which the lobby is accessed via several stairs that lead up to the real level of the lower floor. Its decoration is made up of an alternation of bolstered pilasters made of coppery-grained marble and stucco panels of imitation marble in other tones. The ceiling, just like the rest of the house, is made of plaster, which imitates a coffered ceiling. Two brass lamps stand on either side of the door that leads to the patio, which are in the shape of winged dragons, a type of lamp that was very fashionable at the end of the 19th century. From the lobby, a side door provides access to the basements, which were initially larger and were used as a wine cellar. The patio is undoubtedly the most important and most interesting element of the construction as it serves as a central space which structures, distributes and provides natural light to the parts of the building which are situated further away from the façade. 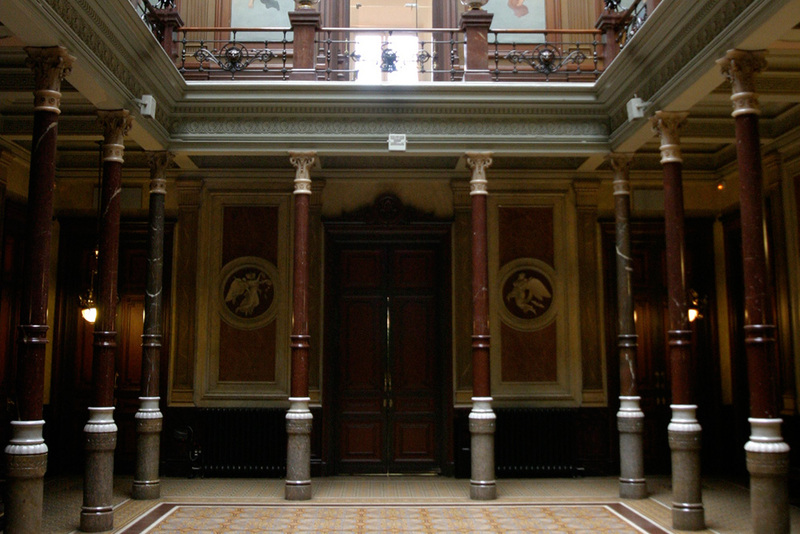 At the same time, it houses the grand staircase and regulates all communications inside the house. The particular characterisation of the patio confirms the role of a central and principal space in the whole building. Although it wasn’t constructed entirely as planned, its resolution is based on a series of pillars surrounding a rectangular space in imitation of a classical peristyle. This was one of the rooms which was intended to be an office or public rooms in which to receive visitors. We find the portrait of Manuel Duran i Bas by Antoni Caba (1838-1907), who was a pioneer portrait painter of his time. In terms of furniture, there is not a lot left in the Palau, but in this room the chairs and benches from the old Board room are conserved which have the initials of the Association and the coat of arms engraved on them and which were made by Gaspar Homar. The chapel is located between the grand staircase and the confidence room. At the time it was normal for houses of a certain status to have a space dedicated to religious retreat and decorated with the artistic repertoire of the medieval period. The chapel is consecrated although nothing original remains. Currently there is a figure of Saint Ramon de Penyafort, which was a gift from a dean, and some pieces donated by the Diocesan Museum. 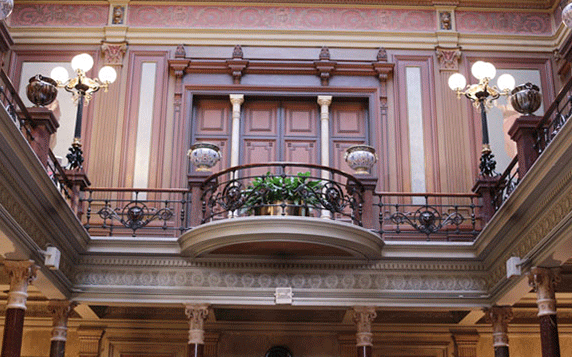 The grand staircase gave exclusive access to the main floor. 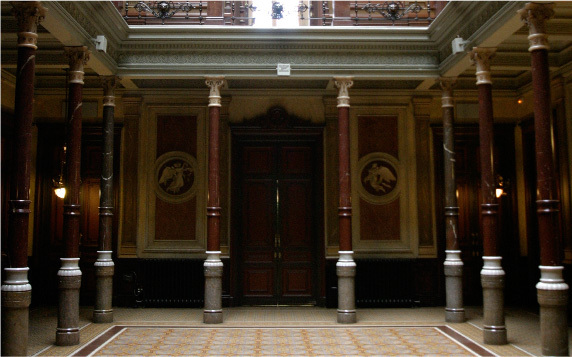 The materials used are the same as those in the patio, with panels that imitate marble and a curious moulded plaster ceiling painted as if it were wood with the application of polychrome pieces that could easily be mistaken for ceramic (the central panel is made of wood and the rest stucco). The staircase and polychrome window are presided over by the profile of a figure in the centre. We can also observe a contemporary panel from 1998 which substitutes one that was already there during the Francoist period and which gives praise to those fallen for the sake of the nation. The main floor is accessed via the grand staircase and is undoubtedly the most important level of the building as it housed the private life of the family. The bedrooms are found here, the rooms that preceded and separated the different chambers, and the areas dedicated to personal hygiene. Just like the ground floor, there was a hierarchical division of space, which saw the front part of the house with the façade looking onto the Mallorca street reserved for the private chambers of the Casades married couple. The rest of the chambers were for the other members of the household. Before entering the chambers, the wall mural paintings must be highlighted which represent allegories to the 12 months of the year, also attributed to Eduard Llorens. The current Board Room of the Association was once the main bedroom of the masters of the house. The space is separated into two sleeping quarters, side by side, and acted as a transitional space of an area aimed for a more public use than a private one. Hardly any original elements remain in these rooms apart from the ceiling. The chambers on either side were the couple’s bedrooms and one of their distinctive features was that they were dissimilar. was a Catalan painter and decorator who trained at the Llotja School and subsequently complemented his studies in Paris under the direction of Glevre. He specialised in decorating interiors, becoming one of the renowned painters of his era. The expansion of the Association was carried out from 1950 onwards, when it was decided to build upon the whole plot next to the Roger de Llúria Street after demolishing the stables. The building was commissioned from the architect Agustí Borrell i Sensat (1910-1971). Right from the beginning, the idea was to keep in line with the mansion with this new building, constructing a main body that was perpendicular to the original and continuing the façade to the chamfered corner. In fact, the exterior part of the original building and that of the 1950’s looks like the same building. The most important intervention regarding the façade was the elimination of the side façade that looked onto the chamfered corner. The main façade that ran from Mallorca Street to the chamfered corner was also changed. works of the sculptor Jaume Duran. 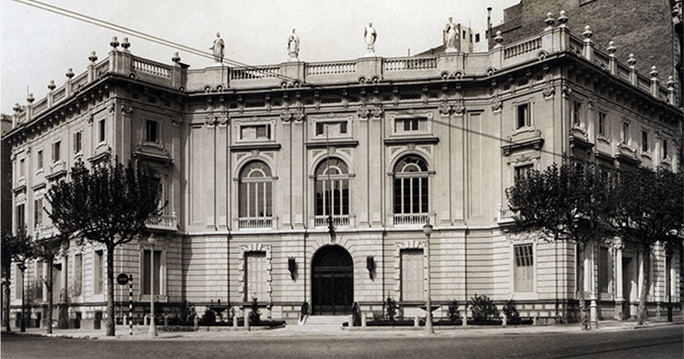 The new headquarters of the Association was inaugurated on the 14th of April, 1953. 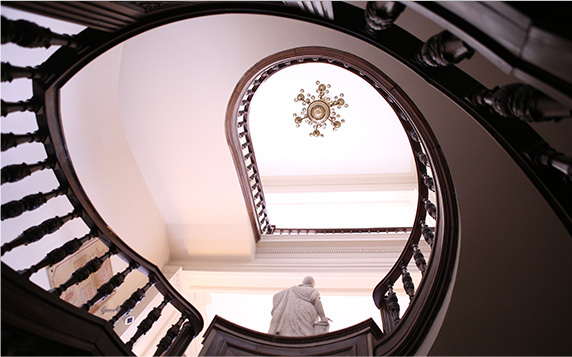 The entrance on the main façade provides access to the lobby and the grand staircase, which proceeds in semi-circular sections and provides access to the function room and the library. In the lobby we can find the initials of the Bar Association, accompanied by the inauguration date of the building, 1953, and other important dates in Catalan law, all made of metal. The staircase is made of marble and stone from Figueres, presided over by a sculpture of Minerva, presumed to be from the 18th century, and allegorical paintings of the lunettes above the side doors, work of the painter Santasusagna. The Auditorium has a capacity of 350 people. It is circular in shape and covered with wood. The lighting is also overhead from a skylight that occupies the stalls. We must mention the two sculptures on the sides of the stage that represent Julio César and Palas Athena. The Bar Association was constituted on the 17th of January 1833 as a newly created association without any link to other existing professional entities. 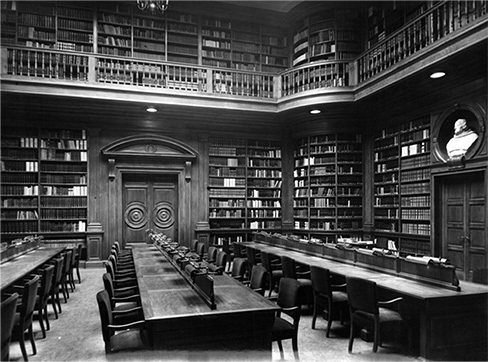 In the arrangements made at the time of creation it was already planned that, as long as the Association’s funds allow, a library for the use of registered lawyers would be created. But it was a long time before the library became a reality. In 1838 one of the outbuildings of the Palau de l’Audiència (which is now the Palau de la Generalitat) was fitted out and the acquisition of a set of books was agreed upon so that the collegiate members could have them close at hand. 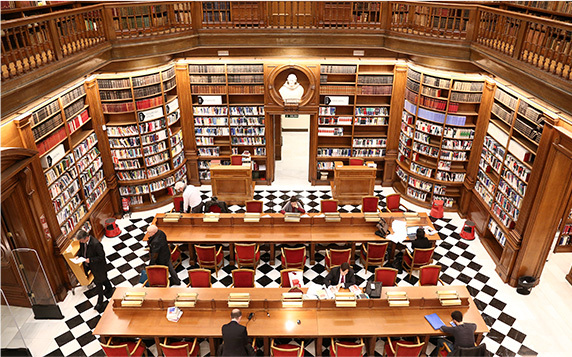 But nonetheless, with a limited urgent bibliographical repertory, the base of what would be one of the most important legal libraries in Europe was created. It was Manuel Duran i Bas who gave the library a definitive impulse during his deanship. He presented a report to the Board in which he demanded that a quarter of the Association’s acknowledged income be automatically directed to the library. Therefore, some money was put towards acquiring books. The main intention of the library was to enhance its historical/heritage element, something which materialised with the acquisition of a codex of Usatges (Usages) which date from 1402. This does not mean that the acquisition of magazines or books necessary for carrying out the profession was disregarded, as the sizeable collection of books from the first third of the 19th century is testament. 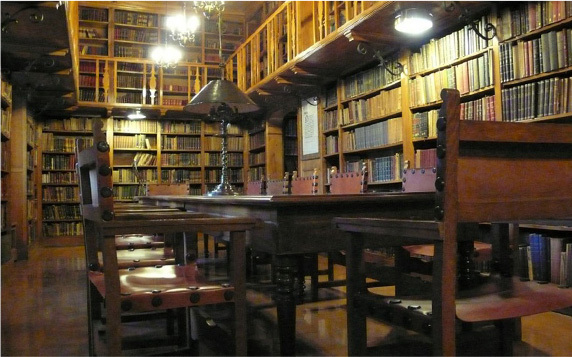 In order to round everything off, another figure from the association ended up being librarian: Guillermo M. De Brocà, who finally followed through with the idea of creating a Catalan Legal Library. La nueva biblioteca está inspirada en las bibliotecas inglesas, con todo su mobiliario de madera. Preside la sala el patrón del Colegio, San Ramón de Penyafort, representado en un busto. San Ramón de Penyafort fue un religioso dominico catalán y uno de los grandes especialistas en derecho canónico en la Edad Media. El busto original fue concebido por el escultor fue Eusebi Arnau (c1895). Según consta en acta, esta obra fue encargada a Arnau el 18 de diciembre de 1895. La escultura formaba parte de la Sala de Juntas de la antigua sede del Colegio, instalado en la Casa de la Ardiaca. El busto original estaba acompañado de dos esculturas de ángeles que sostenían una palma y una esfera, y enmarcando el conjunto dos columnas jónicas con guirnaldas a cada lado. Actualmente, se conserva el busto original. También hay que destacar la “Sala dels Usatges”, inaugurada en 1962 cuando el Colegio conmemoró el 900 aniversario de los Usos de Cataluña. El código fue el primer código civil de Barcelona, que explicaba los usos y costumbres. Fueron las primeras leyes catalanas. 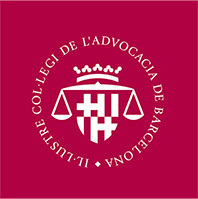 Although there is proof that law has been practised since the 14th century, its gild organisation came about on the 17th of January 1833 following a stipulation in a Real Cédula (a Royal Decree) which called for the formation of professional associations of Law in the capitals which had Audiences or Chancelleries, as was the case for Barcelona. Like many others, initially they didn’t have their own headquarters and used to meet at the home of Miquel Llobet, the chosen dean. After four years they were able to begin meeting in an outbuilding of what used to be the Sant Felip Neri Convent, in 1857 in a chamber at the Territorial Court at the Palau de la Generalitat. In 1866 the Association had its own premises in the form of a rented first-floor flat at number 8, Lleona Street, on the corner of Avinyó street. In 1896 it moved into the first floor of the Casa de l’Ardiaca, where it remained until the end of January 1924 when it established itself in the Palauet Casades, at number 283 Mallorca Street. We must not forget that it is an institution, which was constituted first and foremost to serve the interests of law professionals.